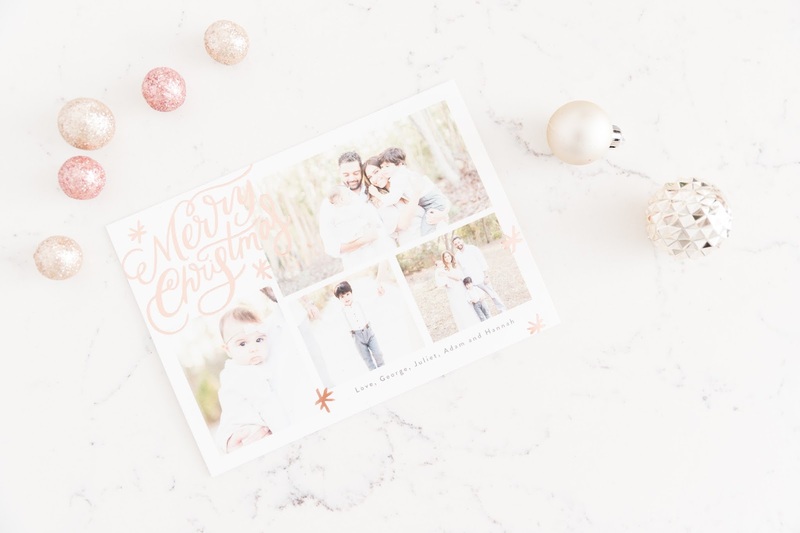 This post is sponsored by Minted and contains affiliate links. This means if you click and/or make a purchase through these links, I may make a commission from that click and/or purchase. All thoughts and opinions are my own. The holidays are officially upon us and that means the hustle and bustle of the season has begun. 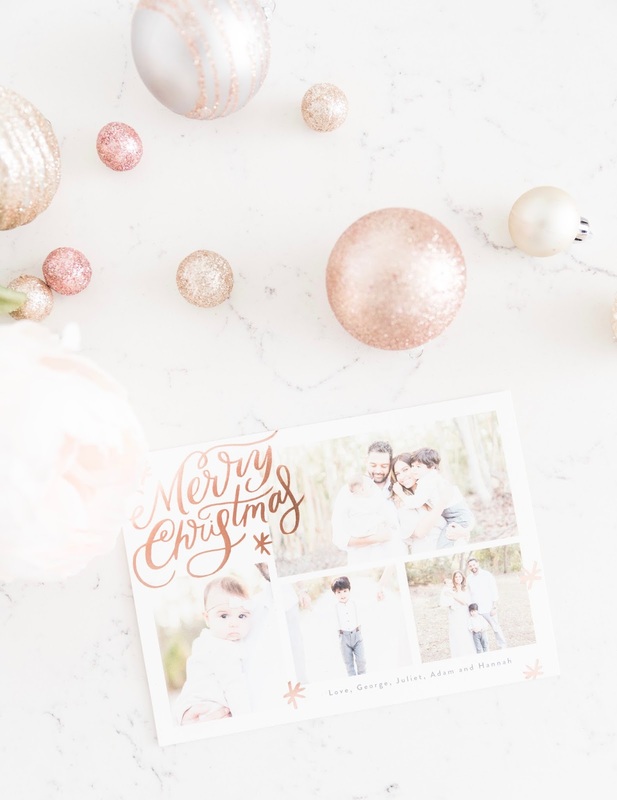 While it can get quite hectic this time of year, one of my favorite things to do is to take a break from all the holiday shopping (and stress) to send out Christmas cards to our family and friends. In our tech era where we hardly send out snail mail, I appreciate getting Christmas cards from our loved ones and displaying them around the house. So every year since George and I got married, I make sure to take the time to mail out some holiday cheer, the old fashioned way! 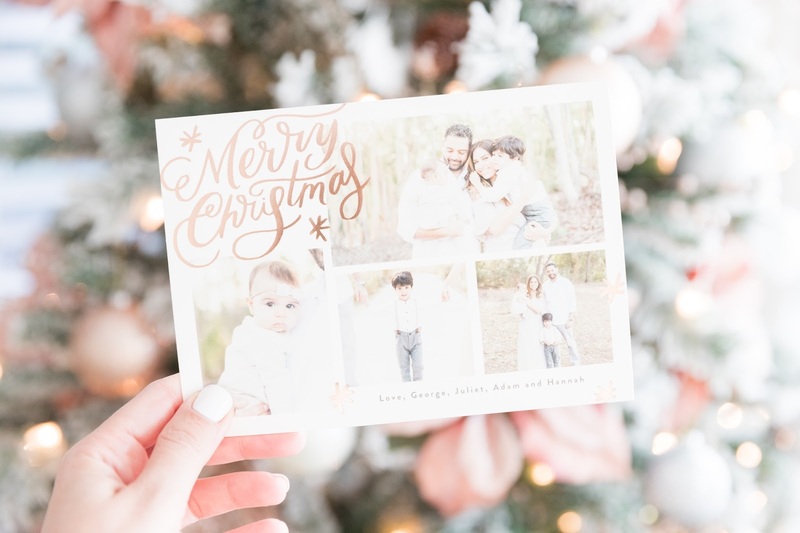 Before we had kids, I would send out a Christmas card with a pretty design and a special message. 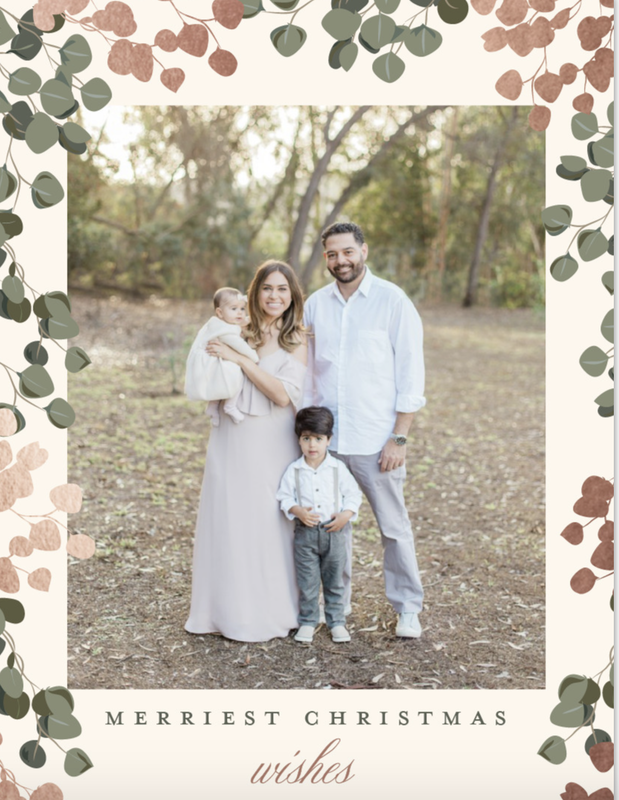 As silly as this may sound, I remember looking forward to the day when we would have kids so that I could send out a more personalized card with our family photos. While we certainly could have sent out a card with a picture of just the two of us, it would have been too cheesy for us. Plus, do our family and friends really want to get a photo of me and George in the mail? LOL. The best part about getting a photo card is seeing all your family and friends’ cute kids! 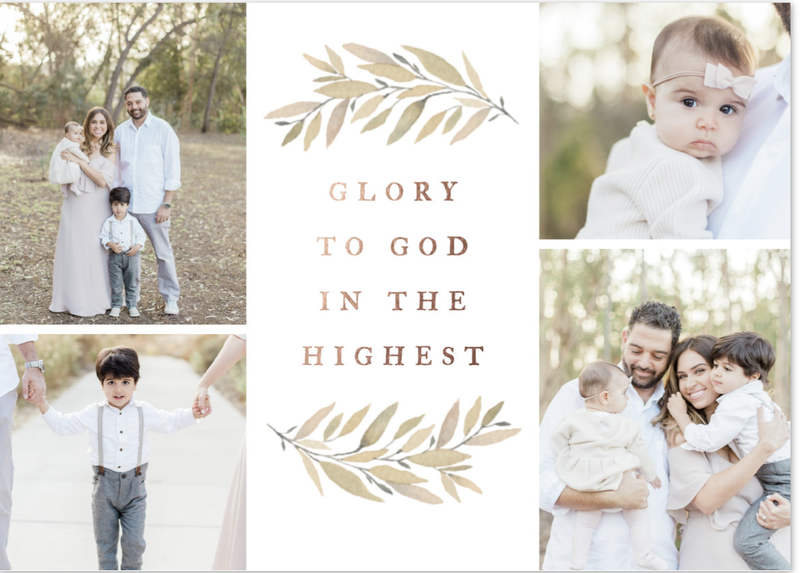 So ever since we had Adam, I make it a point every year to take family photos and ordering customized Christmas cards. Although there's a lot of work that goes into the photo session itself (like finding a photographer, booking a date, coordinating family outfits and then trying to get everyone to look in the same direction as the camera without having epic meltdowns), it's so worth it once you get those photos back. As a mom, I'm usually the one behind the camera, so I appreciate having professional photos taken with my kids once a year. 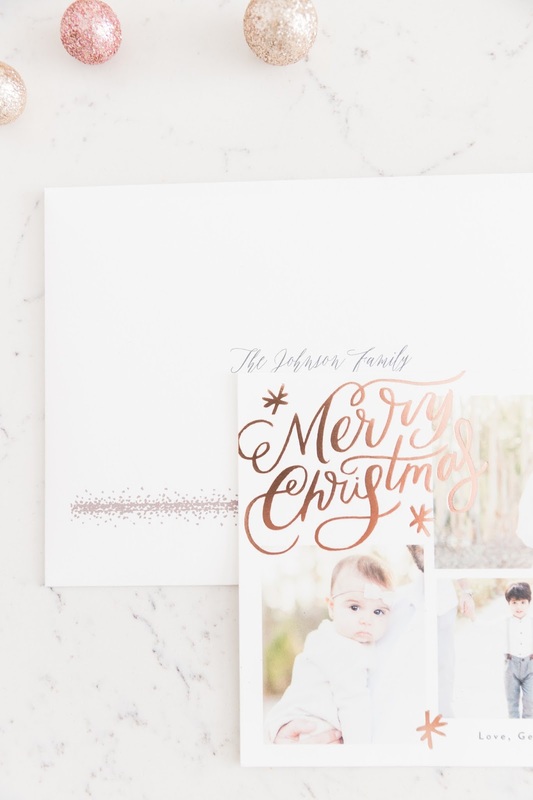 This year, I decided to go with Minted and I couldn't be happier with how they turned out. Since our photos have that "light and airy" feel, I wanted a card that would compliment that look. I knew that I wanted a foil-pressed card so I narrowed down my search to just those. Then I got to choose from gold, silver, rose gold, glittery gold and glittery silver. Picking out a design was super hard since they have so many beautiful ones to choose from. I ended up going with the rose gold to match the look and feel of our pictures and absolutely love how it turned out. The foil-pressed rose gold is definitely my favorite part of the design; it's such a beautiful touch and is like jewelry for your Christmas card LOL. If the foil-print isn't really your thing, they also offer an awesome selection of letterpress cards as well. OR, if you prefer cards with a beautiful design and no photo (maybe you don't have kids yet? haha), they have tons of really unique designs to choose from. 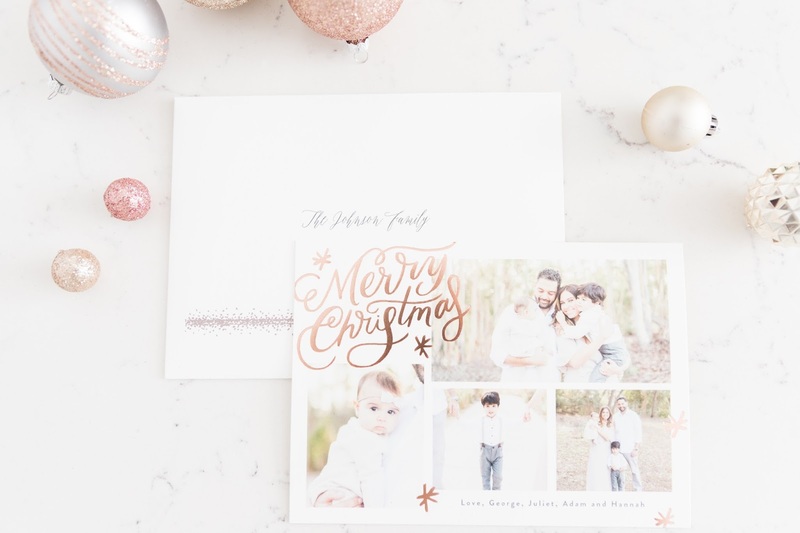 Minted also offers free matching envelopes and recipient addressing with your order which is huge! Not only is this a time saver, but also a pretty detail for a more personalized touch. All you have to do is upload an excel document and they do the rest! Once you choose your design, you can add further customization by choosing between different fonts, wording, background color and edge design. 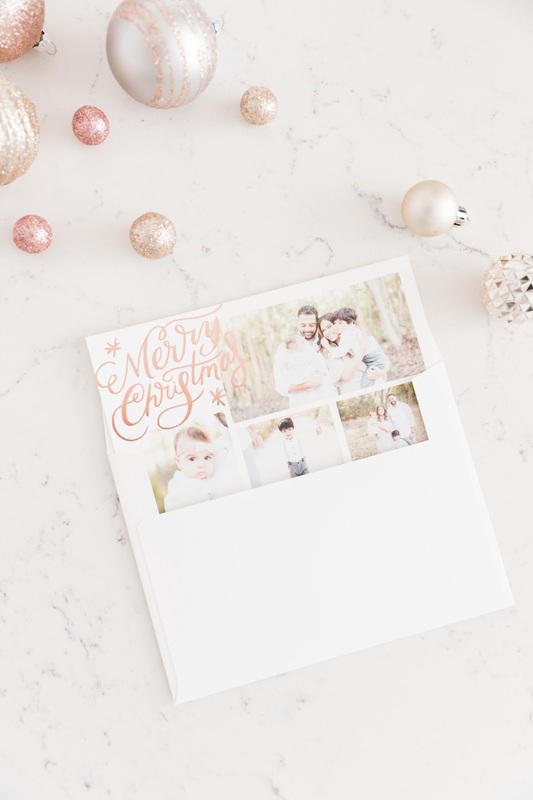 You can even customize the back of the card if you want to add additional photos and text; the possibilities are endless! And if you want to get extra fancy, you can even choose a different envelope color, select a liner and add custom stamps. Upon checkout, you then have the option of having your digital proof reviewed before it goes to print, OR, you can select the express service by skipping the proof and sending your card straight to print. The latter option will save you 5 bucks and 3 days! I chose the express option and got my cards really fast. I placed the order on a Friday and got it the following Wednesday! That's good to know in case you end up scrambling to order last minute cards with all the holiday chaos. 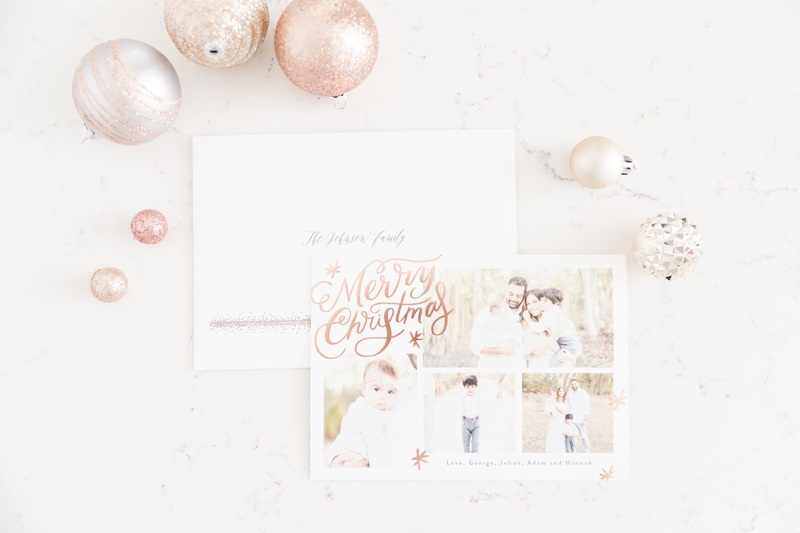 With all the options you have between the card print type, foil-pressed color selections and custom addressing, you can design a card that is truly personalized and your own. Your biggest challenge is going to be narrowing it down to just one! You can see some of the other designs I contemplated below. Enjoy! I really liked this option because the border was similar to the setting in our photo. You can change the background color of this card which is nice. This card was another contender. I just love the font and placement of the foil. I also really loved this option. 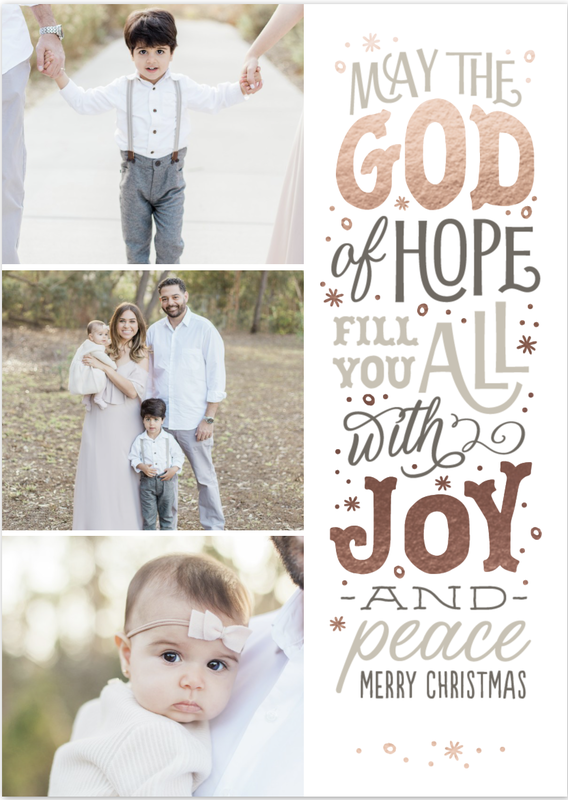 Thank you to Minted for sponsoring this post.